Intel announced its researchers are now testing a small "spin qubit" quantum computing chip. You aren't likely to run this chip at home anytime soon though, it requires a temperature close to absolute zero. The press release from Intel mentions "roughly 460 degrees below zero Fahrenheit", which is kinda weird as that is below absolute zero (-459.67°F). Intel researchers are taking new steps toward quantum computers by testing a tiny new "spin qubit" chip. The new chip was created in Intel's D1D Fab in Oregon using the same silicon manufacturing techniques that the company has perfected for creating billions of traditional computer chips. Smaller than a pencil's eraser, it is the tiniest quantum computing chip Intel has made. The new spin qubit chip runs at the extremely low temperatures required for quantum computing: roughly 460 degrees below zero Fahrenheit – 250 times colder than space. The spin qubit chip does not contain transistors – the on/off switches that form the basis of today's computing devices – but qubits (short for "quantum bits") that can hold a single electron. The behavior of that single electron, which can be in multiple spin states simultaneously, offers vastly greater computing power than today's transistors, and is the basis of quantum computing. The zigzag lines in the photo are printed wires connecting the chip's qubits to the outside world. One feature of Intel's tiny new spin qubit chip is especially promising. Its qubits are extraordinarily small – about 50 nanometers across and visible only under an electron microscope. About 1,500 qubits could fit across the diameter of a single human hair. This means the design for new Intel spin qubit chip could be dramatically scaled up. Future quantum computers will contain thousands or even millions of qubits — and will be vastly more powerful than today's fastest supercomputers. 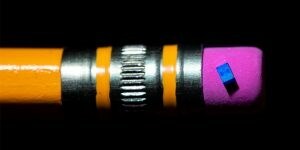 The photo above shows Intel's spin qubit balanced on a pencil eraser.